Numerous studies have indicated to us that the proper maintenance of trees is critical in reducing storm damage during high winds. During our last storm with strong winds, you may have found yourself eyeing the trees closest to your homes and driveways warily—and with good cause! Trees that are not properly maintained are more likely to fail during high winds, thus making them a risk to ourselves and our properties. One of the main causes we can pinpoint as a factor in tree failure during high winds is canopy density. This dense canopy catching the wind during storms is known as the sail effect. The foliage of a tree can act as a sail, causing the tree to bend with the wind. In a strong storm or hurricane, some bending of the trunk is expected, but how much bend occurs is dependent upon if the tree was pruned or not. Pruning to reduce density in the canopy allows wind to pass through. Dr. Ed Gilman, Professor of Urban Trees & Landscape Plants for the University of Florida, Environmental Horticulture Department studied the effects of pruning on tree stability. The results of his testing were incredibly helpful in determining not only the effects of high winds on trees, but which kinds of pruning were the most effective in preventing potential storm damage. Dr. Gilman tested twenty trees of the same age and species (Oak). These trees were divided into 4 categories, with five trees in each category. The pruning treatments were as follows: no pruning, reducing, thinning, and raising. The effectiveness of the different pruning methods varied—but all trees that were pruned were subject to less stress than those that were not. This was measured through the angles that the lower and upper portions of the trunk were bent at while being subjected to hurricane-force winds. So what do these results mean for us, and why is trunk movement important? Based on Dr. Gilman’s findings, removing branches from the crown of a live oak tree will reduce the movement of the trunk, thus reducing the likelihood of the tree failing in the trunk or root system. These results support the implementation of structural pruning as a preventative for storm damage, and a way to eliminate the sail affect. With hurricane season approaching in Virginia, the risk of storm damage is on the rise. 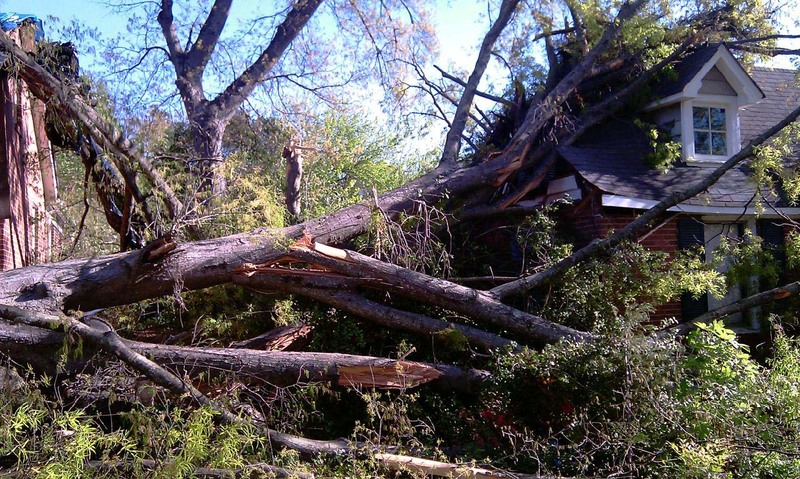 Whether it’s to protect yourself, your family, or a tree you love, don’t let a lack of tree maintenance be the reason you’re dealing with storm damage.